A guest has just walked up to your front door. Do they comment on its stunning appearance? Or, do they grimace at its unsightly look? If it is more of the latter, then the clear choice would be to invest in one of the many replacement doors available from Clear Choice Energy Solutions. We offer a wide variety of exterior doors to meet the needs of homeowners in La Crosse, WI, and other western Wisconsin communities. Our options include front entry door systems as well as patio doors and storm doors crafted by some of the top manufacturers in the industry. Each one of our exterior doors is custom built to the exact dimensions of the entryway and are available in thousands of different variations thanks to numerous style, color, and hardware options. Yet, our doors are built for more than just beauty. They are constructed of extraordinarily durable materials to provide years of protection from the elements and intruders, and they built to provide the ultimate in efficiency through inclusion of the latest energy-saving advancements. Plus, our front entry door systems are backed by a lifetime warranty for your peace of mind. And, if you need a new patio door or want a storm door for extra protection for your front entry system, then we can accommodate those needs as well through our partnerships with leading replacement door manufacturers ProVia, Wincore, and Therma-Tru. 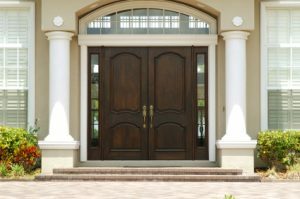 Here at Clear Choice Energy Solutions, we take pride in offering our customers what we feel are the very best exterior doors available. In fact, we only offer replacement doors that we would install in our own homes. Yet, we know that even the most durable doors won’t perform as they should if they are not installed correctly. That is why we offer a professional installation. We only use experienced and manufacturer-certified installers to install all of our exterior doors to ensure a job well done. And, we treat each home with the respect it deserves; we will vacuum the work area, wipe down the finished product, and haul away all jobsite debris once we are finished, so it appears as if we were never there. Our goal is to provide our customers with nothing less than a five-star installation experience. To learn more about our available exterior doors, contact Clear Choice Energy Solutions today. Proudly serving La Crosse, WI, and the surrounding area, we are happy to schedule a consultation to help you find new doors that address your needs.